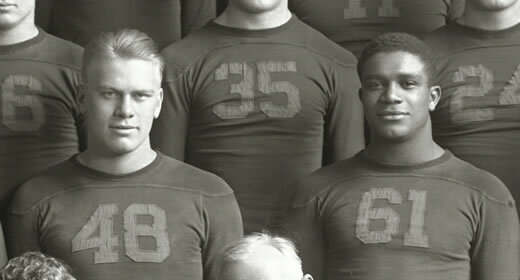 On January 23, the Center for Local, State, and Urban Policy (CLOSUP), the Gerald R. Ford School of Public Policy, and the Center for Public Policy in Diverse Societies will present the documentary Black and Blue: The Story of Gerald Ford, Willis Ward, and the 1934 Michigan-Georgia Tech Football Game. The film will screen at 4 p.m. in the Ford School's Annenberg Auditorium and will be followed by a panel discussion featuring son of President Ford, Steven Ford, and grandson of Willis Ward, Buzz Thomas. The film, directed by Brian Kruger and written by Buddy Moorehouse, examines the 1934 football game between Michigan and Georgia Tech, which refused to field their team unless the U-M agreed to bench their star end, and only black player, Detroit-born Willis Ward. Ward's friend and roommate, Gerald Ford, was outraged by the decision—along with many within the U-M and Ann Arbor communities—and initially threatened to quit the team, until Ward convinced the young Ford to change his mind and play in the game. The film documents what was one of the most disgraceful yet, ultimately, inspiring incidents in Michigan football history. The event also served as an ethical benchmark in the life of future U.S. president, Gerald Ford. Director of CLOSUP and J. Ira and Nikki Harris Family Professor of Public Policy, Barry Rabe, delivered a stirring speech on Ford the "global president" at the University's 89th Honors Convocation last March. President Ford rarely spoke of the largely forgotten Michigan-Georgia Tech scandal "Black and Blue" examines until he penned a New York Times op-ed in 1999 defending the University's use of affirmative action in admissions, "Inclusive America, Under Attack." Timed to coincide with the U-M's Martin Luther King Day events, the panel discussion and screening also are early offerings in what will be a full year of activities and events celebrating Gerald R. Ford's forthcoming 100th birthday this July. Attendees can pick up buttons commemorating the year-long celebration at the screening. A couple of Ford School events in late 2012 also marked the Gerald Ford 100th milestone, including a public lecture by former Ford administration "Energy Czar," Frank Zarb and a tribute to the life and legacy of First Lady Betty Ford, both in October. State and Hill also includes a profile of the "irrepressible" Mrs. Ford in its fall 2012 issue. Gerald Ford 100th events will continue throughout the year with the unveiling, in April, of a miniature statue of President Ford—an exact replica of the full-scale statue that sits in the Capitol Rotunda. Former Ford cabinet member Brent Scowcroft will deliver the dedication, followed later that month by Paul O'Neill's much-anticipated Ford School commencement address. The Ford School will welcome more visitors this fall as it ramps up its celebration of President Ford's birthday and prepares to kick off the school's 100th anniversary in 2014. Visit the website frequently for updates or follow the hashtag #fordlegacy on Twitter.